Tribal Clash Australia teams, here are your events for Saturday 9th February. The team starts lying prone behind the baseline, hands on sandbags. On GO team completes 25 squats with the log worm. The worm must be in Zercher hold for reps to count. The elbows or logs must not touch the knees at any time. All athletes must have hip crease below parallel at the same time at the bottom of the rep and stand with hips fully extended at the top of the rep. The athletes must stand in a line facing the lighthouse. After 25 squats, 3 athletes start doing synchro burpees over the worm with 2 athletes starting on one side of the worm and 1 athlete on the other side, facing the sea. Athletes’ chests and thighs must be on the floor at the bottom of the burpee, and the rep must have a two-footed take off and landing. The athletes must have chest to floor at the same time but they do not have to jump at the same time. Remaining three athletes must be lying on the floor behind the baseline hands on sandbags for the burpee reps to count. The team can swap the three athletes on burpees however they wish. After 10 burpees, all athletes return to the log and repeat the log squats. After Event 1 time out, the team exits straight down the lane to the shoreline and picks up a rescue board. All six athletes must have hands on the board before the team can start. The team completes a swim in the sea around a marked course. All athletes must stay in contact with the board at all time. The team can have one athlete on the board. When the team has completed their swim, they head out through the green start flags and onto a trail run. Shoes must be worn on the run. Your registration bags will have a detailed map of the run course, in addition please follow the signs. Each individual athlete’s time will be logged at the run finish gate. The team’s score for Event 2 is the combined finishing times for all six athletes. The finishing time will include the time taken to complete the team rescue swim. Please ensure you wear your race numbers for this event. Without a race number, you will not receive a score. Each lane has 5 x 60kg sandbags and 1 truck tyre. The team starts lying prone behind the baseline, hands on sandbags. On GO the team starts transporting the objects from one end of the lane to the other. The objects and athletes must go over the beams, both ways; athlete cannot return to assist another athlete except by going over the beam. No body parts can go under the beams to assist another athlete. The sandbags and the tyre must be carried, not dragged. The tyre must not touch the ground, but it can be rested on a beam. There will be an immediate 10 second penalty for infringement where the judge will tell the team to freeze and stop moving for 10 seconds. The 10 second penalty starts when all six athletes have stopped. The team scores one point for each object + athlete over the baseline. If any object hits the black baseline bags, the team receives an immediate 10 second penalty. At time cap, the team scores a rep for any object over the baseline that is accompanied by an athlete. This event has two scoring parts, each for time. Event 4 is an individual sprint relay followed immediately by a paired wheelbarrow walk relay. 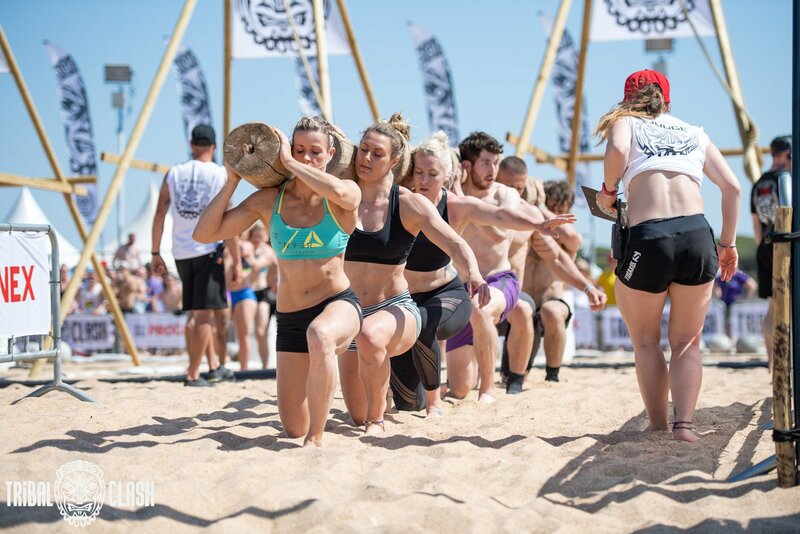 The team then goes straight into Event 5, a team log worm lunge. The team starts lying prone inside the lane facing the crowds with hands on sandbags. On GO the first athlete jumps up, turns round and sprints down the lane, turns right, and continues around the arena until he is back in the lane. Once he is back in the starting position with hands on sandbags, the next athlete runs the same course. The sprint portion is over when all 6 athletes are back lying on the sand in the same position they started in. The team then starts working in three pairs. The first pair gets up and starts their wheelbarrow walk relay – the athlete whose feet are being carried must start with their hands on the baseline, reverse out, perform a 180 degree turn and walk down the lane. Feet must be carried with hands on ankles. The athlete must not touch the floor with any other body part except hands until they reach the opposite baseline. If any part of their body touches the ground, the athlete receives a 10 sec penalty. The athlete walks two lengths of their lane (up and back) then once they are back in their starting position, they swap with their partner who also walks two lengths. When all three pairs have completed a wheelbarrow walk, time for Event 4 is logged. Event 5 is a team log worm lunge. The team picks up the worm, lunges it down the lane, turns right, and lunges around the arena until they are back in their lane. The time for Event 5 is logged when the worm is back in its starting position. If the team does not finish within the time cap, they score a rep for each 5 metre mark around the arena, and their score is total lunge reps. The team gets an immediate 10 second penalty stood up holding the worm on shoulders for any shuffle steps, or if the team touches a barrel or another team. If there is a collision, the team coming from behind will be deemed to be at fault. For this event the teams stage at the Red Paddle staging area at Fairy Creek. The race will be started on the water when all teams are standing on their board behind the start line. The teams paddle two laps around a marked course in the creek. At the marker before the Finish flags, all paddles must be placed on the board before exiting the water. The first lap has an 8 minute cut off, any team not at the Finish gate within 8 minutes will not proceed to the second lap, and their score is the time after one lap. The time is logged when all six athletes cross the finish line with their board after the second lap. Teams that completed only one lap will be placed below teams that completed two laps on the leaderboard.